From the ClearContext Scorecard in Outlook, you can compare your email performance to all other ClearContext Users (Scorecard > My Stats > Compare Stats). On ClearContext Online you can also compare with smaller groups. For example, here’s a graph of TWC User’s statistics. After you have logged in, open Preferences. Available Groups to Join are listed on the right side of the page. Click to join. Once you have joined, the group will be listed for comparison on your Scorecard and Stats page. Anyone can join Public Groups from the Preferences page (i.e. 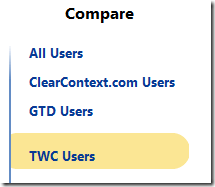 TWC Users, GTD Users). Private Groups are available for many companies, including Microsoft, Intel, EMC and HP. If you registered for ClearContext Online with your company email, the group will automatically be listed under Available Groups to Join. Once validated, any private groups available for that domain will be listed on the Preferences page. Follow directions above to join. If you want to create a private group for your company, send us a note at support at clearcontext dot com and we’ll get the process started. 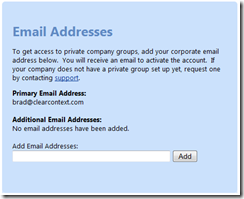 Posted by ClearContext Corporate Blog — Compare Your Stats to Another Individual – ClearContext Corporate Blog on September 21st, 2009.